In mid-August New Planet Beer journeyed to beautiful Telluride, Colorado to participate in the annual Telluride Festival of the Arts Grand Tasting. This event provided New Planet Beer the unique opportunity of sampling our beer to event attendees with refined palates who usually favor wine to beer. Although we participated in such an event with some trepidation, New Planet Beer is pleased to announce that Grand Tasting attendees gave us a warm-welcome and lots of positive feedback. Many people said they enjoyed the refreshing, fruit-forward taste of 3R Raspberry Ale. 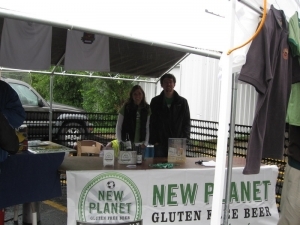 They also were pleased to learn more about New Planet Beer’s mission to do good things for the planet by donating a portion of proceeds to local environmental restoration and conservation programs. We will look forward to participating in future events in Telluride and are pleased to announce that New Planet Beer can be purchased in numerous locations in the southern part of Colorado. For more information on where to find us in Telluride and the surrounding area, check out the ‘Where to Find Us’ section on our website. This summer has been a momentous one for New Planet Beer. After our initial success in bringing great-tasting gluten-free beer to our fans in Colorado early last year, we decided to start joining the fun by visiting beer festivals and other events throughout the state. In doing so, we’ve been able to enjoy a closer interaction with new and existing fans of New Planet Beer. We’ve had a lot of fun and learned some valuable lessons for future events in the process. So without further ado, we give you the top 10 things we learned in our first eventful summer! Give them pretzels! 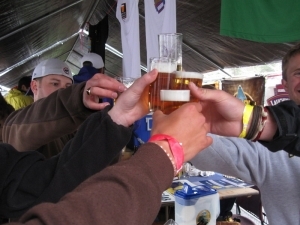 Did you attend any of the numerous Colorado beer festivals this summer? If you did, we’re sure that you caught at least one glimpse of a gluten-free pretzel necklace-adorned New Planet Beer fans. That’s because we know that spending several hours in the summer heat tasting beer can stir up an appetite. At future events we’ll continue our practice of supplying gluten-free pretzel necklaces to gluten-free festival goers. We need more swag. Festival and event-goers love to pick up swag. While supplies lasted, we were happy to provide New Planet Beer bottle openers made from recycled materials to people who visited our booth. Next year we plan on expanding our offerings with stickers as well! Also, look for more great New Planet Beer t-shirt and hat designs, soon to be available for purchase on our website. Pretty decorations sometimes backfire. Not every event location is conducive to having a decorative set-up. Case in point: the Fort Collins Colorado Brewer’s Festival, where our beautiful 8-foot standing banner repeatedly toppled onto our interns in the wind. Moving forward, we’ll reserve top-heavy decor for indoor venues. New Planet Beer tastes like beer! Please allow us some lighthearted joking at the expense of our fans. It was quite entertaining when someone new (especially gluten-free folks) tasted Tread Lightly Ale and remarked, “Wow! This tastes just like beer!” Thank you. Though an obvious statement, we are delighted that our fans are recognizing the fact that New Planet Gluten-free Beer is, in fact, beer. Volunteers melt in the sun. In addition to making us more visible over the crowd of event-goers, having a tent next year will prevent our volunteers and interns from overheating, sunburning, or otherwise looking miserable in the Colorado summer. More S,M, and less XXL That’s right. New Planet Beer t-shirts were all the rage when we initially passed them out for free and started offering them for a nominal price at events. The only problem: we didn’t anticipate how many of you would want one! We’re sorry for the t-shirt shortage and we’re working on a solution that will allow us to have more sizes and colors available in the future. The possibilities are endless. We participated in 14 fantastic events this summer and had the opportunity to participate in many more. Doing so allowed us to offer samples of New Planet Beer to over 18,500 thirsty event-goers. Future event planning will include a wide variety of venues and types, with a focus on those that promote planet-friendly practices or donate to environmental programs we support, in keeping with the mission of New Planet Beer. We can’t read chicken-scratch. Having our email sign-up sheet at events allowed many of you to receive this monthly newsletter. Unfortunately, some folks are not reading this because we couldn’t read their handwriting. We are exploring the possibility of making our email sign-up sheet digital as an alternative to having our interns study ancient and lost languages. Kegs are heavy. Fortunately, volunteers and staff at other breweries were friendly and let us borrow their hand-trucks. Otherwise, our interns would have rolled away with our kegs on more than one occasion. Live and learn: hand-trucks are on our shopping list. We love our fans. The absolute best part about being at events was meeting you, hearing your stories, and enjoying some cold New Planet Beer as friends. Thanks for supporting us at events this year! We look forward to continuing to brew great tasting gluten-free beer for you! New Planet Beer is now being brewed in the new Fort Collins Brewery. Fort Collins Brewery (FCB) just opened their new state-of-the-art brewery, restaurant and shops. This exciting facility is located on the northwest corner of Lemay and Vine in Fort Collins, CO. A visit is worth scheduling, as this is one of the most innovative brew houses today. FCB moved its existing 15 barrel brew house over to the new digs, but will be supplementing greater production with the latest in automated 50 barrel systems in the near future. Since New Planet Beer will now be brewed in this larger capacity facility, we can ensure an endless supply of gluten-free beer. The new brewery also utilizes the most current thinking in sustainable, green technologies. FCB is most proud of their water waste system which is not connected to a public sewer, but rather recycles waste water on to farmlands. This is very much in-line with New Planet Beers efforts to strive to reduce environmental impact so we thankful that Fort Collins Brewery has taken extra steps in making this happen. New Planet Beer will have the honor of being available in the new restaurant and on tap in the tasting room, so all of you who are eager to visit a brewery with a great tasting gluten-free beer, Fort Collins Brewery is the place to go. Check out these videos and be one of the first to see the new Fort Collins Brewery and New Planet Beer coming of the production line…and soon to a store near you. New Planet Beer was thrilled to be at Estes Park Brewery last Saturday for the Rocky Mountain Brewfest! Despite the chilly and wet weather, the event had a great turnout. 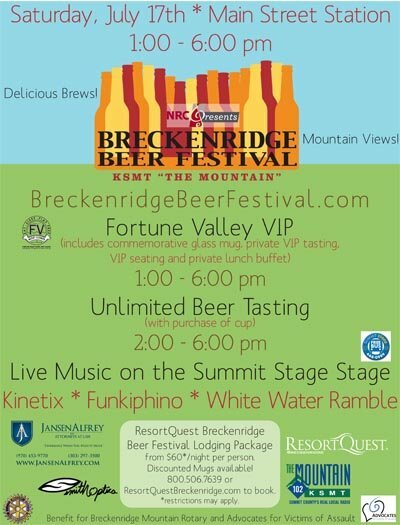 The Rocky Mountain Brewfest featured beers from several Colorado breweries, live music, and great food. We were grateful for the opportunity to dispense samples of Tread Lightly Ale to festival attendees, which made many new fans of New Planet Beer. 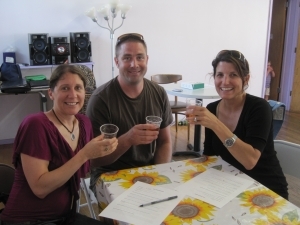 Both gluten-free beer drinkers and regular beer drinkers alike showed up to sample New Planet Beer. Many people said that they were pleasantly surprised with the way that Tread Lightly Ale tastes so much like regular beer, despite the use of sorghum and corn instead of wheat. We are glad that our efforts to provide a delicious gluten-free beer are bringing enjoyment to beer drinkers in Colorado. If you’re sad you missed us at the Rocky Mountain Brewfest, never fear. We will be at the Colorado Brewer’s Festival in Fort Collins on the 26th and 27th of June, sampling our Tread Lightly Ale and debuting our 3R Raspberry Ale. Please come and find us, say hello, and enjoy a cold one, compliments of New Planet Beer! 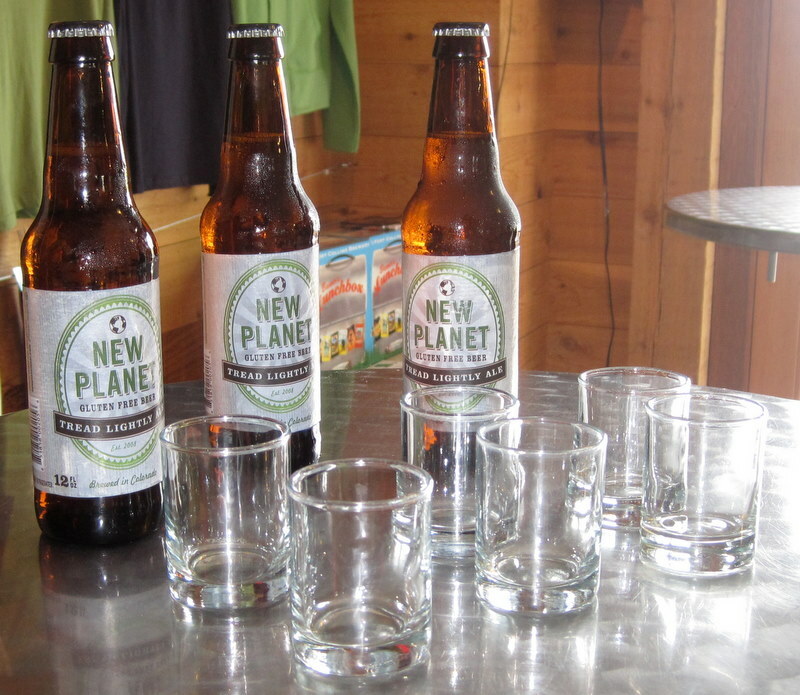 New Planet Beer had the pleasure of serving samples and conversing with customers at Whole Foods in Denver, CO. The Tamarac Whole Foods is the only Colorado location that has the ability to sell alcohol, so tasting events take place every Saturday from 1-6pm. In addition to two premium wine options, Tread Lightly Ale flowed freely throughout the day. 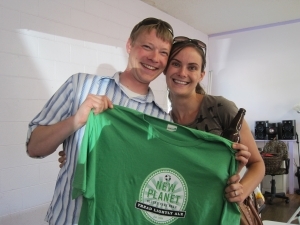 Enthusiastic patrons who bought a six pack during our visit also received a one-of-a-kind organic New Planet Beer t-shirt. In addition, everyone that came by our both received a bottle opener and an informational card describing the unique background of gluten-free beer. The talk of the day was centered around the forthcoming release of the New Planet 3R Raspberry Ale which should be hitting the shelves this summer. Be sure to keep an eye out for this Raspberry delight as it’s sure to be a hit. Special thanks to the kind team members of Whole Foods for supporting New Planet Beer and their assistance throughout the day. We look forward to many similar events this summer of which will be promoted through our website.